They lay in lines, the car salesman who'd just lost his eye but whose feet were still dribbling blood, the motorcyclist who was shot by American troops near the Rashid Hotel, the 50-year-old female civil servant, her long dark hair spread over the towel she was lying on, her face, breasts, thighs, arms and feet pock-marked with shrapnel from an American cluster bomb. 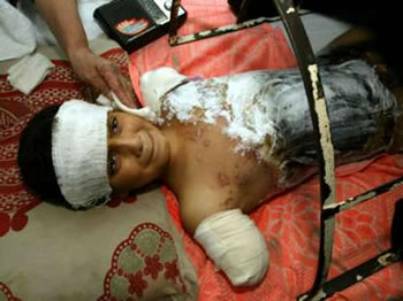 For the civilians of Baghdad, this is the real, immoral face of war, the direct result of America's clever little "probing missions" into Baghdad. It looks very neat on television, the American marines on the banks of the Tigris, the oh-so-funny visit to the presidential palace, the videotape of Saddam Hussein's golden loo. But the innocent are bleeding and screaming with pain to bring us our exciting television pictures and to provide Messrs Bush and Blair with their boastful talk of victory. I watched two-and-a-half-year-old Ali Najour lying in agony on the bed, his clothes soaked with blood, a tube through his nose, until a relative walked up to me. "I want to talk to you," he shouted, his voice rising in fury. "Why do you British want to kill this little boy? Why do you even want to look at him? You did this – you did it!" The young man seized my arm, shaking it violently. "Are you going to make his mother and father come back? Can you bring them back to life for him? Get out! Get out!" In the yard outside, where the ambulance drivers deposit the dead, a middle-aged Shia woman in black was thumping her fists against her breasts and shrieking at me. "Help me," she cried. "Help me. My son is a martyr and all I want is a banner to cover him. I want a flag, an Iraqi flag, to put over his body. Dear God, help me!" It's becoming harder to visit these places of pain, grief and anger. The International Committee of the Red Cross yesterday reported civilian victims of America's three-day offensive against Baghdad arriving at the hospitals now by the hundred. Yesterday, the Kindi alone had taken 50 civilian wounded and three dead in the previous 24 hours. Most of the dead – the little boy's family, the family of six torn to pieces by an aerial bomb in front of Ali Abdulrazek, the car salesman, the next-door neighbors of Safa Karim – were simply buried within hours of their being torn to bits. On television, it looks so clean. On Sunday evening, the BBC showed burning civilian cars, its reporter – "embedded" with US forces – saying that he saw some of their passengers lying dead beside them. That was all. No pictures of the charred corpses, no close-ups of the shriveled children. So perhaps I should warn those of what the BBC once called a nervous disposition to go no further. But if they want to know what America and Britain are doing to the innocent of Baghdad, they should read on. I'll leave out the description of the flies that have been clustering round the wounds in the Kindi emergency rooms, of the blood caked on the sheets, the blood still dripping from the wounds of those I talked to yesterday. All were civilians. All wanted to know why they had to suffer. All – save for the incandescent youth who ordered me to leave the little boy's bed – talked gently and quietly about their pain. No Iraqi government bus took me to the Kindi hospital. No doctor knew I was coming. Let's start with Mr Abdulrazek. He's the 40-year-old car salesman who was walking yesterday morning through a narrow street in the Shaab district of Baghdad – that's where the two American missiles killed at least 20 civilians more than a week ago – when he heard the jet engines of an aircraft. "I was going to see my family because the phone exchanges have been bombed and I wanted to make sure they were OK," he said. "There was a family, a husband and wife and kids, in front of me. "Then I heard this terrible noise and there was a light and I knew something had happened to me. I went to try to help the family in front of me but they were all gone, in pieces. Then I realized I couldn't see properly." Over Mr Abdulrazek's left eye is a wad of thick bandages, tied to his face. His doctor, Osama al-Rahimi, tells me that "we did not operate on the eye, we have taken care of his other wounds". Then he leant towards my ear and said softy: "He has lost his eye. There was nothing we could do. It was taken out of his head by the shrapnel." Mr Abdulrazek smiles – of course, he does not know that he will be forever half-blind – and suddenly breaks into near-perfect English, a language he had learnt at high school in Baghdad. "Why did this happen to me?" he asks. Yes, I know the lines. President Saddam would have killed more Iraqis than us if we hadn't invaded – not a very smart argument in the Kindi hospital – and that we're doing all this for them. Didn't Paul Wolfowitz, the US Deputy Defense Secretary, tell us all a few days ago that he was praying for the American troops and for the Iraqi people? Aren't we coming here to save them – let's not mention their oil – and isn't President Saddam a cruel and brutal man? But amid these people, such words are an obscenity. Then there was Safa Karim. She is 11 and she is dying. An American bomb fragment struck her in the stomach and she is bleeding internally, writhing on the bed with a massive bandage on her stomach and a tube down her nose and – somehow most terrible of all – a series of four dirty scarves that tie each of her wrists and ankles to the bed. She moans and thrashes on the bed, fighting pain and imprisonment at the same time. A relative said she is too ill to understand her fate. "She has been given 10 bottles of drugs and she has vomited them all up," he said. The man opens the palms of his hands, the way Arabs do when they want to express impotence. "What can we do?" they always say, but the man was silent. But I'm glad. How, after all, could I ever tell him that Safa Karim must die for 11 September, for George Bush's fantasies and Tony Blair's moral certainty and for Mr Wolfowitz's dreams of "liberation" and for the "democracy", which we are blasting our way through these people's lives to create?